NEW PRODUCT – Ad Blocking Kit for Pi-Hole with 2.8″ PiTFT – No Soldering! « Adafruit Industries – Makers, hackers, artists, designers and engineers! NEW PRODUCT – Ad Blocking Kit for Pi-Hole with 2.8″ PiTFT – No Soldering! Tired of webpages that are chock-full of ads and malware – impossible to use? This kit will make a Raspberry Pi 3 act as a DNS (Domain Name Server) The kind of device that tells you that adafruit.com is known as IP address 104.20.38.240. Except, when Pi Hole DNS is installed, it will do a special trick, when it is asked for the IP address of ads.adserver.com (for example) it will return nothing! So you will never even connect to the ad server and get the ad. Your connection will be faster, less data, and no intrusive ads. It works great on computers, tablets, phones, etc. Even if you cannot run an ad-blocker plugin on your phone or tablet, this will work and ad-blocker-detectors can’t tell you’re running it. We also have a guide and kit for using Pi-Hole with the Raspberry Pi Zero W to send advertisements on your network into a black hole. But the PiOLED is small, and we want to monitor more statistics at a glance. While we could open the web console to monitor Pi-hole, we can’t show that to friends easily. Plus, who doesn’t want more shiny, blinky, networking hardware? Upgrade to this Pi-Hole Ad Detection for Raspberry Pi and 2.8″ PiTFT Kit! This pack does not contain a Raspberry Pi comptroller – that’s because you probably have one kicking around and maybe you want to pick one model over the other. We recommend the Raspberry Pi 3 Model B – tried and true, this Pi works great and has both WiFi and Ethernet. You can also use a Pi 2 (doesn’t have built-in WiFi so a dongle is required, or just stick to Ethernet). This requires installing PADD (Pi-hole Ad Detection Display) and Pi-Hole on the Adafruit 2.8″ PiTFT Plus to display useful and fun statistics such as Amount of Pi-holed Advertisements, and the top offending domain attempting to serve pesky advertisements to your network. Follow along with our learn guide to DIY your own! 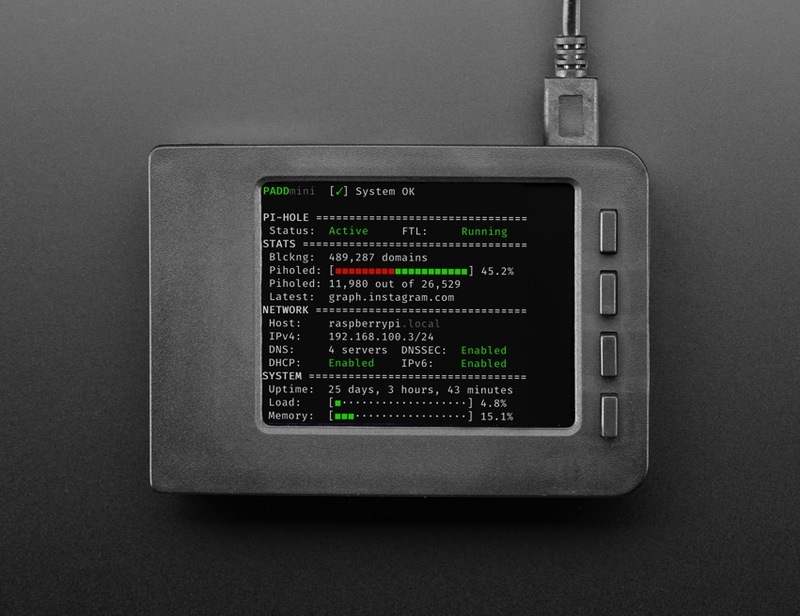 PiTFT Plus Assembled 320×240 2.8″ TFT – one of the cutest little display for the Raspberry Pi. It features a 2.8″ display with 320×240 16-bit color pixels and a resistive touch overlay. Comments Off on NEW PRODUCT – Ad Blocking Kit for Pi-Hole with 2.8″ PiTFT – No Soldering!